Canine Genius | The orignial smart toy for dogs! Canine Genius dog toys are durable, chewable, configurable puzzles that you can stuff with tasty treats. Canine Genius toys connect together - so you can create a variety of puzzles that stimulate curiosity and appeal to your dog's natural desire to hunt and problem solve. Take the toys apart, reconnect them in a different way - even add new components. Canine Genius toys are a chewy new challenge with each and every change! Your dog will never be bored again. 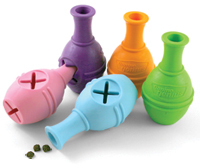 The orignial smart toy for dogs. 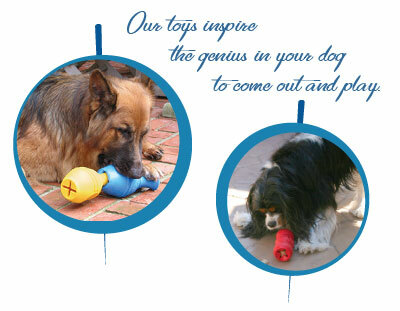 Named in honor of genius Leonardo da Vinci, Leo marks a renaissance in dog toy design. 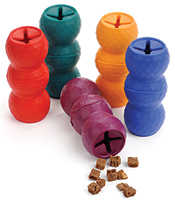 The original connectable treat-release toy! 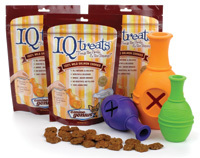 IQ Treats are the Smart way to treat your dog! Grain-free and made from 100% wild caught Norwegian salmon, these bite-sized cookies are extra healthy and fit perfectly inside the original Leo, Mini Leo, Mike and Mini Mike toys. There's a NEW Genius in Town. Named after genius Michelangelo, truly a masterpiece of art that will entice your dog to exercise his/her hunting and foraging skills.